David Lichine’s light-hearted Graduation Ball, an audience favourite over many years, had its world premiere in Sydney on 1 March 1940. Vicente García-Márquez, in his 1990 publication The Ballets Russes, gives some clues to the origins of the work, including notes on the rehearsal process, the development of the musical compilation and on the designs. An interesting slant is cast, however, on the unfolding of the design process and on Lichine’s early ideas for the storyline from an examination of the catalogue to an exhibition, Art for Theatre and Ballet: Australia. The exhibition, under the auspices of the British Council and arranged by Harry Tatlock Miller, was on display in Sydney, Melbourne and Adelaide in 1940. Not all the characters for which Benois had made designs eventually appeared in Graduation Ball, which this ‘new ballet’ clearly became. For example, the only design that appears to have stayed in Australia — no. 398 The Governess (La Gouvernante) held by the Art Gallery of New South Wales in Sydney — does not represent one of the final characters in the ballet. The Sydney design remains of particular interest, however. Its catalogue record notes that it was a gift of ‘Col. W. de Basil’ in 1940. But what is especially interesting about the list is that it contains designs for one divertissement that was only ever seen in Australia. 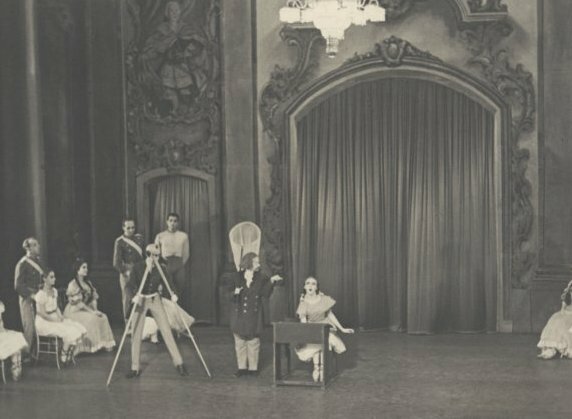 The divertissement ‘Mathematics and Natural History Lesson’ was cut from the ballet, for reasons that are not clear, once de Basil’s company reached the United States after leaving Australia in September 1940. This divertissement was performed by two ‘Professors’—Australian Alison Lee (performing under the name Helene Lineva) who danced the tall, thin professor who manipulated a large mathematical instrument, and Maria Azrova who danced the short, well-padded professor who carried a butterfly net. They instructed a single pupil, danced by Marina Svetlova. It is tempting to speculate that nos 397 and 399 in the catalogue for Art for Theatre and Ballet: Australia are those for costumes worn by Lineva and Azrova. When the original designs are more readily available (at present they appear not to have been digitised and made widely accessible) they can be compared with photographs taken during the 1940 Melbourne season of Graduation Ball by Hugh P. Hall. Helene Lineva (Alison Lee) and Maria Azrova as the two professors with Marina Svetlova as their pupil. ‘Mathematics and Natural History Lesson’, Graduation Ball, Melbourne 1940 (detail). Photo: Hugh P. Hall. Reproduced with permission of the National Library of Australia. The Hugh P Hall material is of significant documentary value. But in addition to his archive, some of the most charming photographs of the world premiere of Graduation Ball were taken by Sydney photographer Nanette Kuehn. Kuehn herself was obviously happy with one particular photograph of Tatiana Riabouchinska, which she autographed to Riabouchinska and which Riabouchinska kept for the rest of her life. When in 2008 the Riabouchinska/Lichine Archive was acquired by the Jerome Robbins Dance Division, New York Pubic Library for the Performing Arts, a beautiful print of the photograph below was part of the collection. It was inscribed ‘Many thanks for all the beautiful dancing. Nanette Kuehn 7-2-40’. Tatiana Riabouchinska as the leading Junior Girl in Graduation Ball, Sydney, 1940 (detail). Photograph: Nanette Kuehn. Papers of Margaret Walker, National Library of Australia, MS 8495, folio box 3, album 3. Postscript: On perhaps a less significant matter, but also relating to the ‘Mathematics and Natural History Lesson’ divertissement, it has always seemed something of an anomaly that in the well known photograph taken of Valrene Tweedie shortly after she had been accepted by de Basil into his company she has her foot resting on an old fashioned school desk. The school desk is in fact the prop used in ‘Mathematics and Natural History Lesson’, a fact confirmed by Tweedie in an oral history interview in 2004. Valrene Tweedie with Colonel de Basil, Sydney 1940. Photo The Sun. Collection of the author. Art Gallery of New South Wales. Alexandre-Nikolayevich Benois (Russia; France, b.1870, d.1960, Costume study for Graduation Ball, 1939. Accession no: 6935. García-Márquez, Vicente. The Ballets Russes: Colonel de Basil’s Ballets Russes de Monte Carlo 1932-1952 (New York: Alfred A. Knopf, 1990). Miller, H. Tatlock. An exhibition of art for theatre and ballet: Australia (London: British Council, [1939?]). Tweedie, Valrene. Oral history interview recorded by Michelle Potter, 4 December 2004. Oral History Collection, National Library of Australia, TRC 5350. I seem to recall that there was another divert. that subsequently disappeared or at least was rethought/rechoreographed. There are photos of it and it appears in the complete Ringland Anderson film of Grad. Ball. Riabouchinska was costumed as a circus high wire artiste and did a mimed high wire act. [On the ground of course]. I believe the replacement number used the same piece of music. At the moment I can’t be sure but it could have been the Perpetuum Mobile section. Yes, there was another one, the ‘circus’ divert, which was called on the program (as you noted) ‘Perpetuum mobile’ and was danced by Lichine and Riabouchinska in Australia. It may have had a slightly longer life than ‘Mathematics’ but it too was dropped. I’m not sure about its replacement. ‘Lichine changed the circus pas de deux that he and Riabouchinska did to be the dance with the three monkeys. There was himself and Riabouchinska, and three girls were the three monkeys; hear no evil, see no evil, speak no evil. And I think that remained the… that particular number in the divertissements always’. Michelle, my understanding from very good source is that Valrene danced as one of the senior girls in yellow in the world premiere of Lichine’s Graduation Ball. ‘The very first thing I did in Grad Ball was one of the four yellow girls. They’re the senior girls. And I suppose I was just tall enough to be one of the taller senior girls and I danced that not in Sydney in the opening season but in Melbourne, Adelaide, Brisbane and when we returned to Sydney. Later in the United States … there must have been someone taller than [I was who] went into the yellow girls, and I was one of the middle girls, the green … two green and two pink. So, I did that part of the ballet. I think I did that mostly through the USA and Canada and South America’. I think in Sydney when the world premiere took place she was not officially part of the company although went on most nights because they made sure there was always someone ‘sick’ and she had to fill in for them! I understand she couldn’t officially be employed by the company until she was 15 (union regulations), which was at the end of March 1940. Here is a link to the program for 1 March 1940, which was the first performance I believe. Thanks Michelle for putting me straight as to when she started performing that part and the program link.